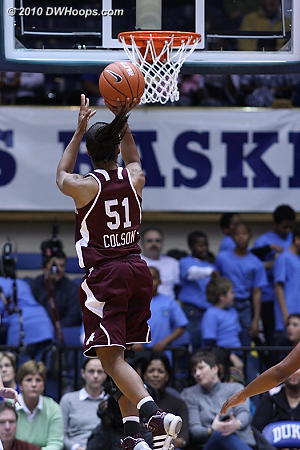 Sydney Colson hit this open look, but would go on to miss her next six. 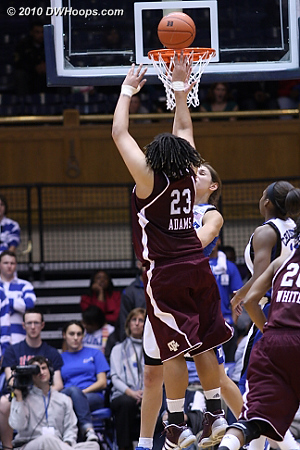 Adams forced her way between Peters and K.Thomas for the layup. 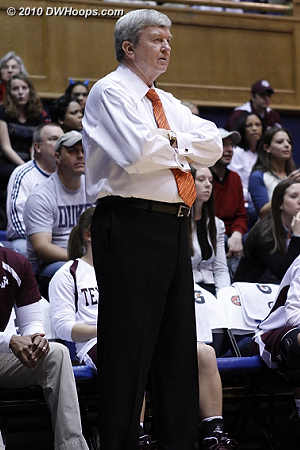 Texas A&M Head Coach Gary Blair shed his suit jacket just before Duke's 16-0 spurt. 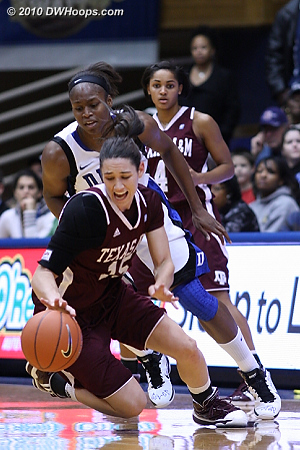 Allison Vernerey was unfazed by the power of Danielle Adams and repeatedly frustrated her in the post. 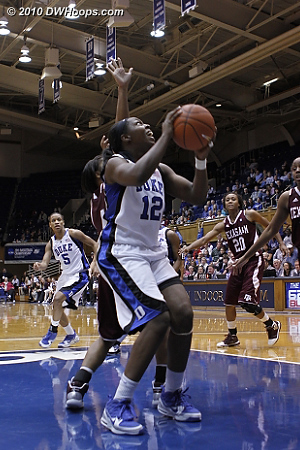 Coach P exorts Duke's defense which finally started getting some good stops. 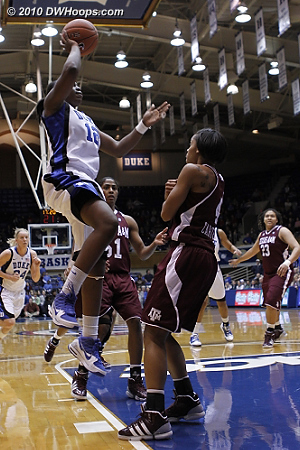 Karima Christmas gyrates through the air to get one of her six first half rebounds. 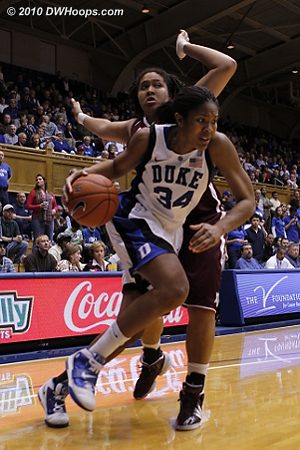 Duke's defense was effective in forcing Danielle Adams to take lower percentage shots outside the paint. 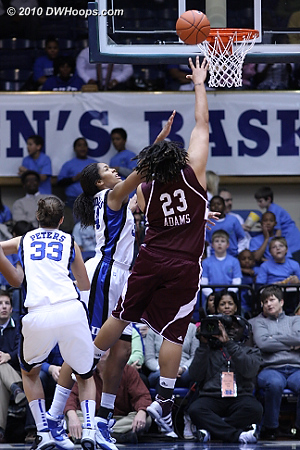 Jasmine Thomas finally got going after a slow start, scoring five in the last five minutes of the first half. 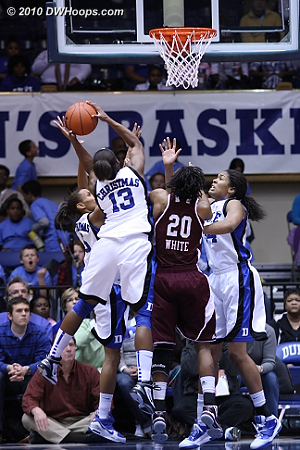 Jasmine Thomas elevates as Danielle Adams readies herself for contact. 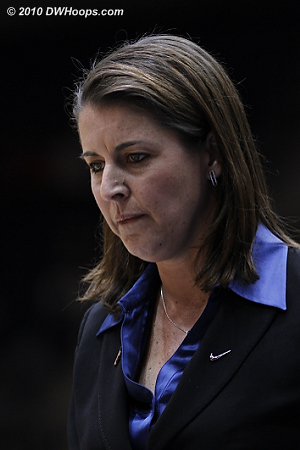 A somber Joanne P. McCallie leaves the court with Duke up 28-27 at halftime. 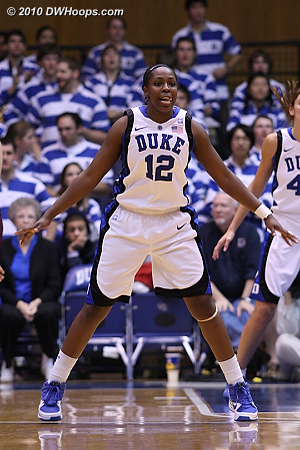 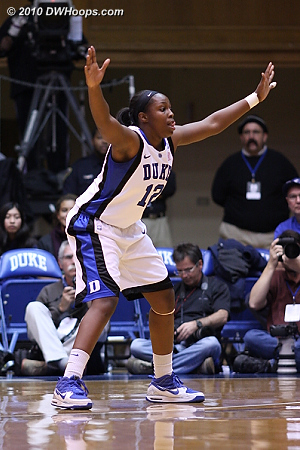 Chelsea Gray nailed a three pointer to put Duke up by six. 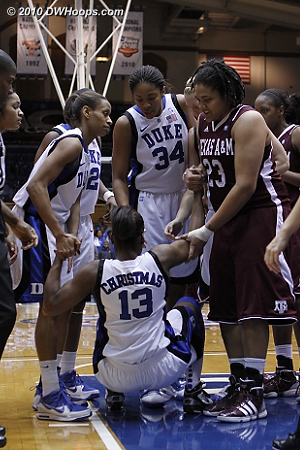 Adams leveled Christmas but also helped her up. 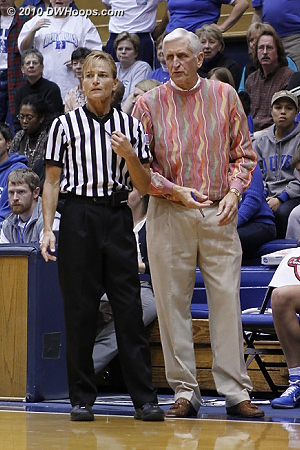 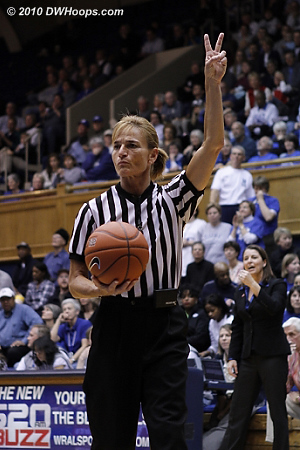 Referee Dee Kantner (talking to Al Brown) was a late replacement for Dennis DeMayo - both are among the nation's top women's basketball officials. 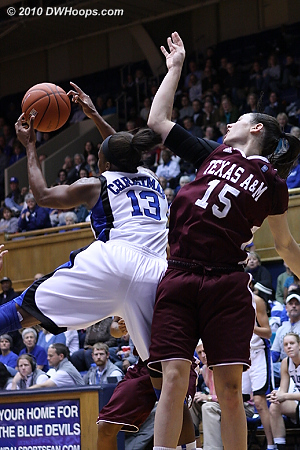 Karima Christmas is fouled by the partially obscured Maryann Baker. 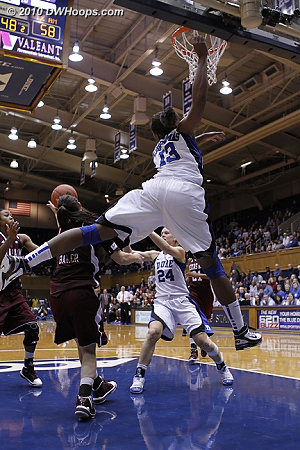 Another defensive board for Christmas whose 11 rebounds matched her 11 points. 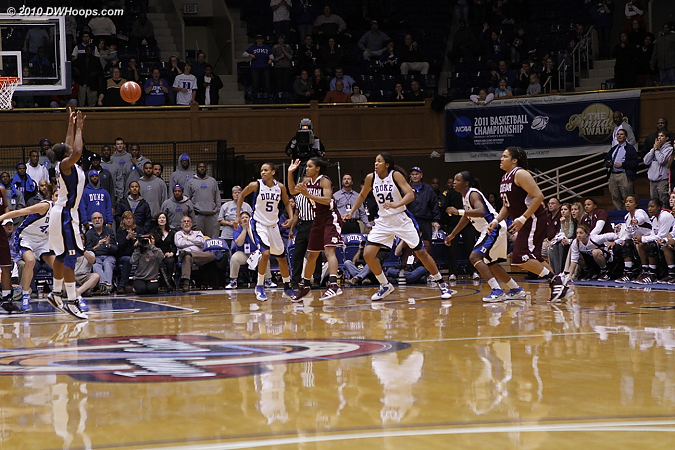 Dee Kanter calls for two shots in a very tightly called second half. 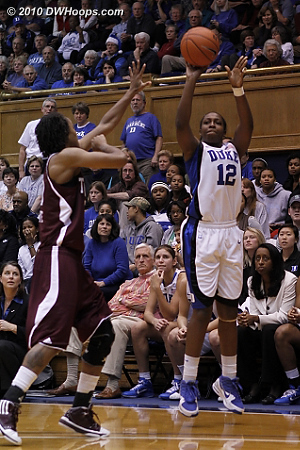 The eyes of Jasmine Thomas on the free throw line. 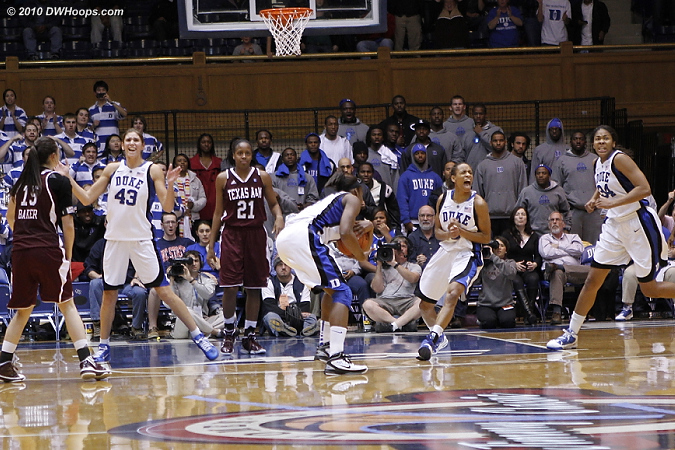 The Duke bench staying in the game as J.Thomas free throws cut the deficit to one. 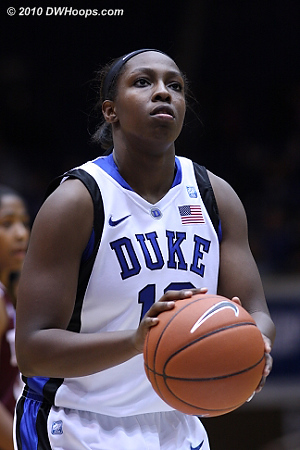 Chloe Wells is whistled for fouling Tyra White, who would miss both. 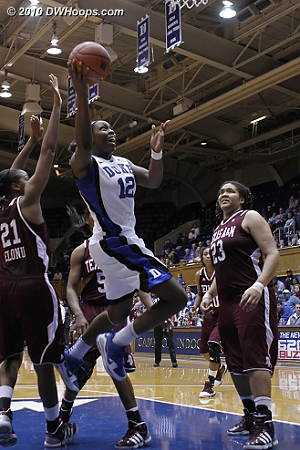 The powerful Danielle Adams reels in a defensive rebound. 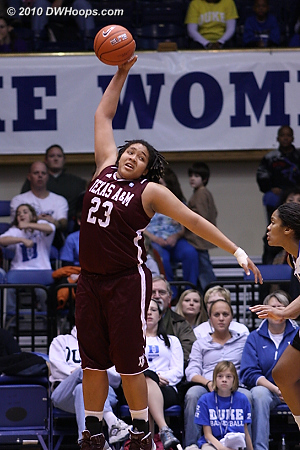 Shay Selby hits a clutch three on a kickout from Chelsea Gray to close the score to 45-44 A&M. 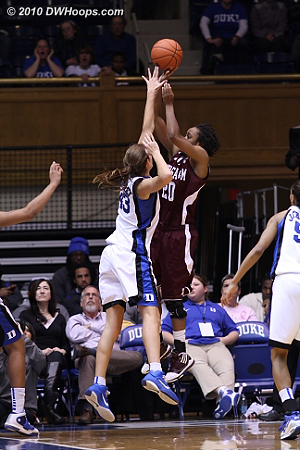 Krystal Thomas is fouled by Kelsey Assarian (obscured), giving Duke the chance to take their first lead in over eight minutes. 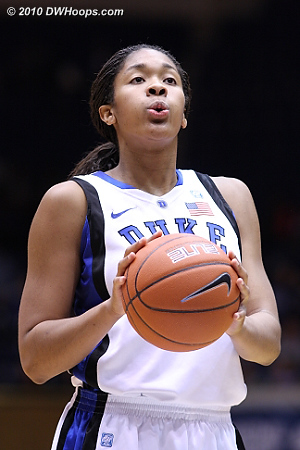 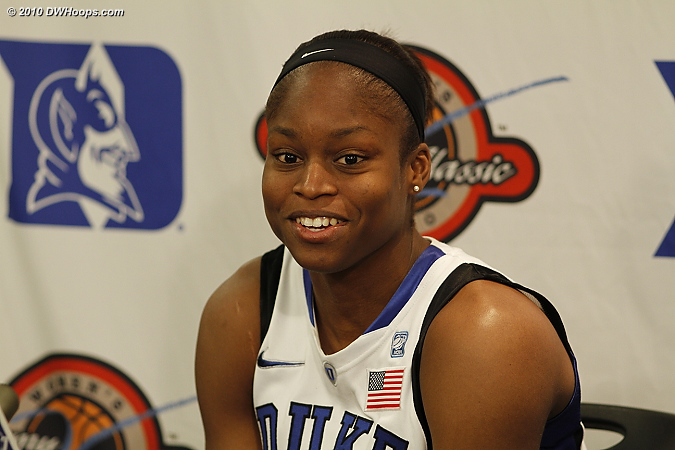 Deep breaths helped Krystal make both freebies, putting Duke ahead 46-45 with 8:48 remaining. 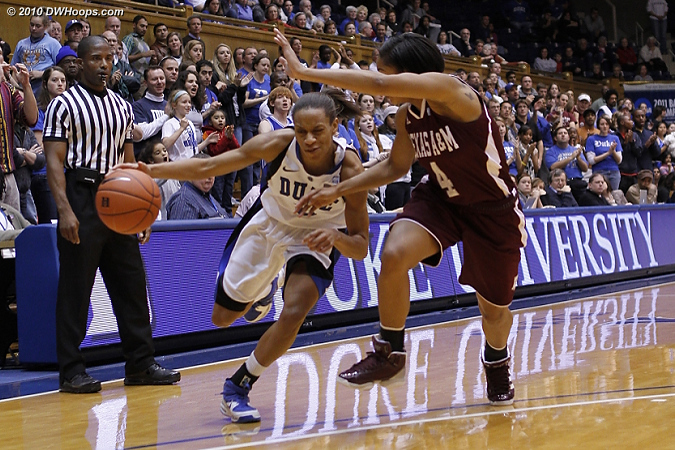 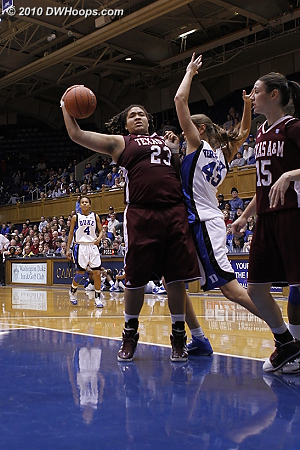 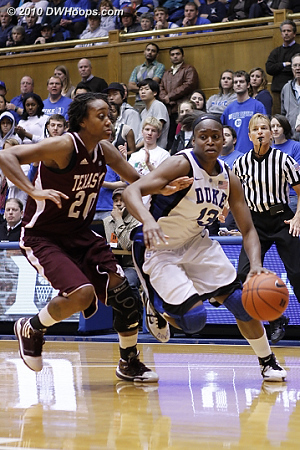 Karima Christmas fouled by Tyra White, the freebies put Duke back in the lead. 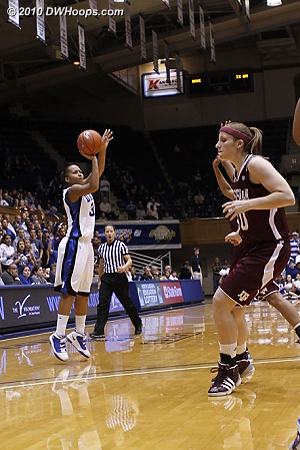 Danielle Adams nails a straight-on three pointer to knot it at 50-50. 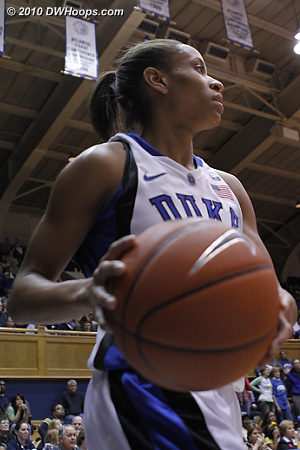 Jasmine Thomas answers with a big three of her own. 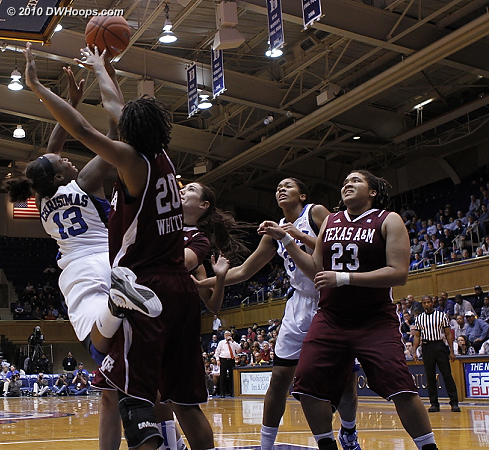 Chelsea Gray was fouled on the way to the hoop. 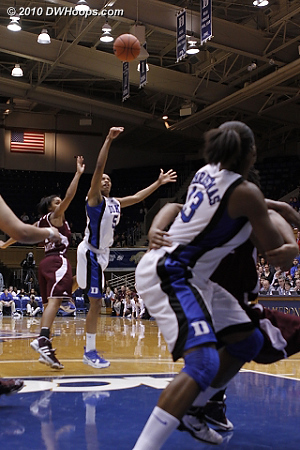 Gray was serious on the line, putting Duke back in front by making both. 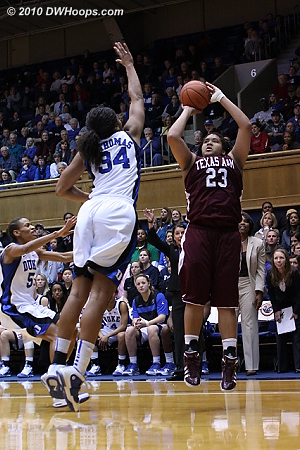 Tyra White sinks a baseline J over Vernerey as the lead trading continued. 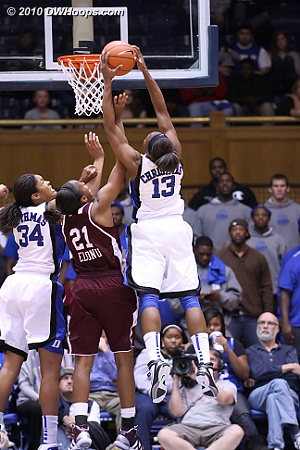 Chelsea Gray scores in the paint. 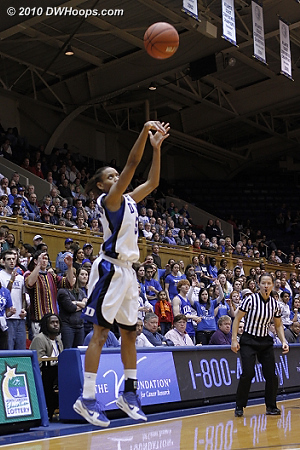 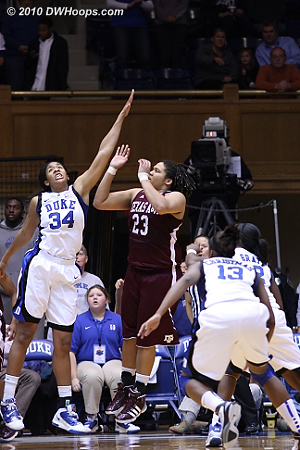 Jasmine Thomas puts up a shot that would give Duke the lead with under a minute left. 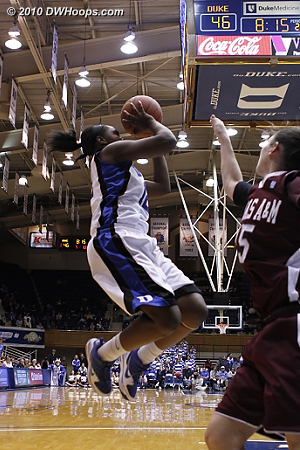 Players jockey for position under the basket; the shot clock buzzer sounds with J.Thomas shot still airborne. 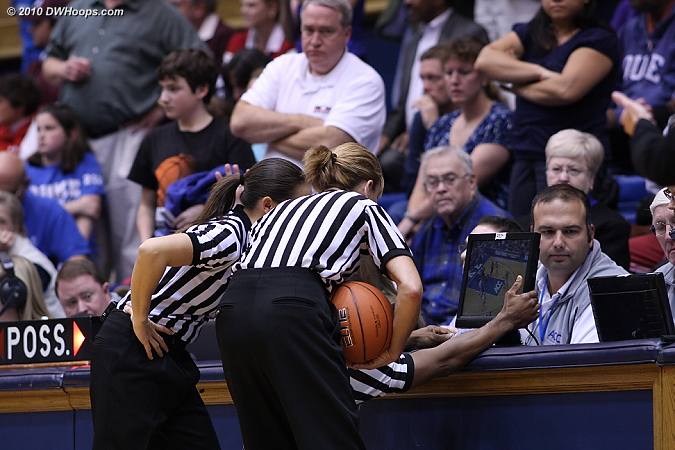 Maj Forsberg (left) and Dee Kantner consult the TV monitor to be sure that Jasmine Thomas' shot beat the shot clock. 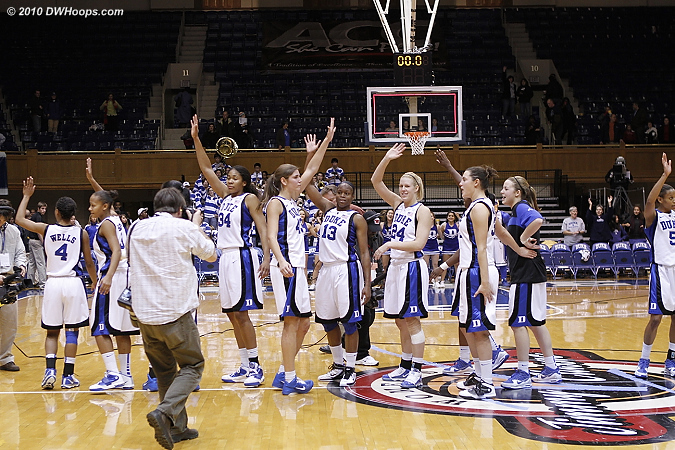 Coach P exhorts the Duke defense with the one point lead, under a minute to play. 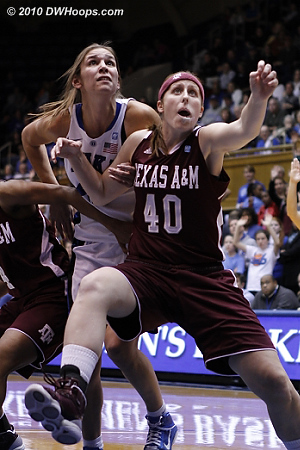 The frantic last moments of the Texas A&M possession resulted in an airball three by Sydney Colson as the shot clock expired. 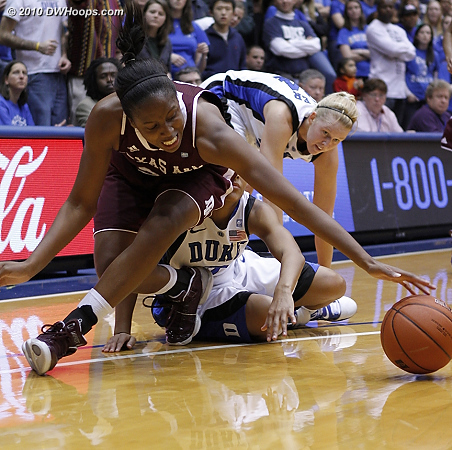 A Duke turnover gave A&M one last chance down three, but Karima Christmas stepped into the passing lane to prevent the Aggies from getting a last shot. 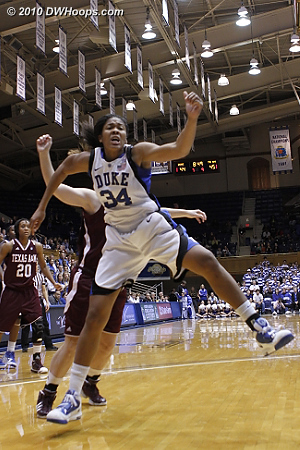 Duke wins! 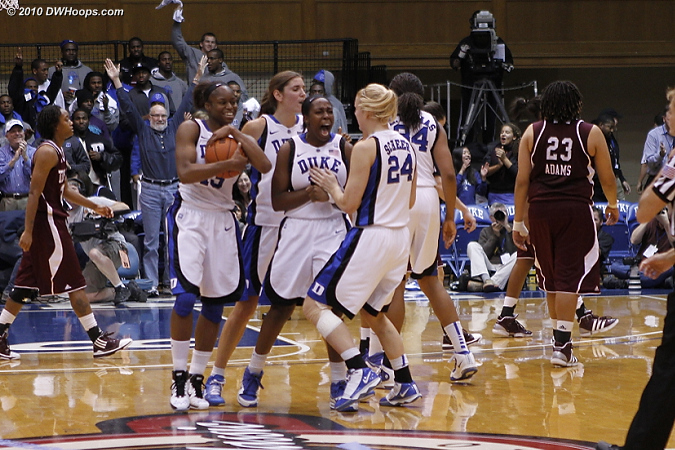 Celebration on the court for the Blue Devils, knocking off #7 Texas A&M. 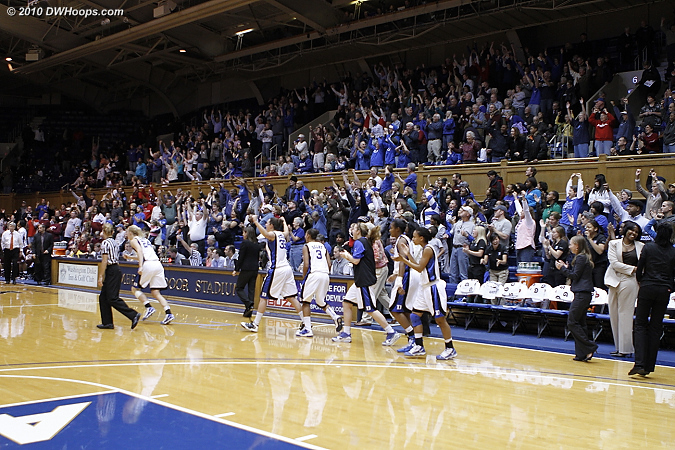 The bench and crowd go wild! 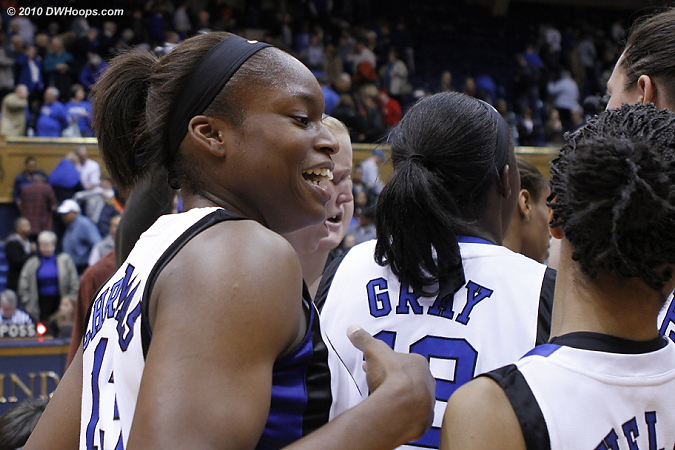 Karima Christmas cradles the game ball as Chelsea Gray tells Kathleen Scheer how happy she is. 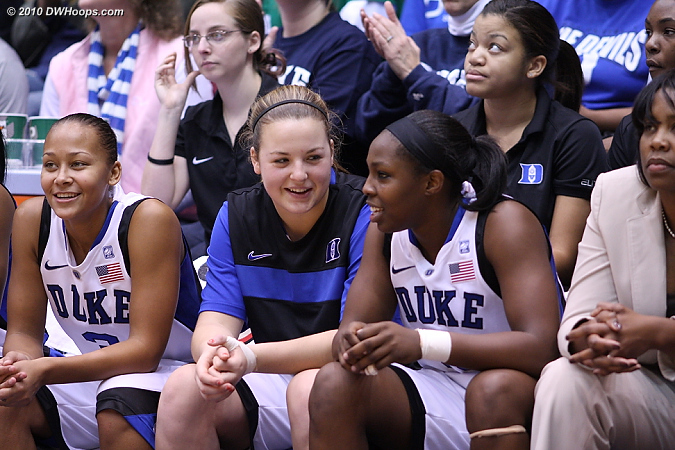 Karima as the Duke victory huddle breaks. 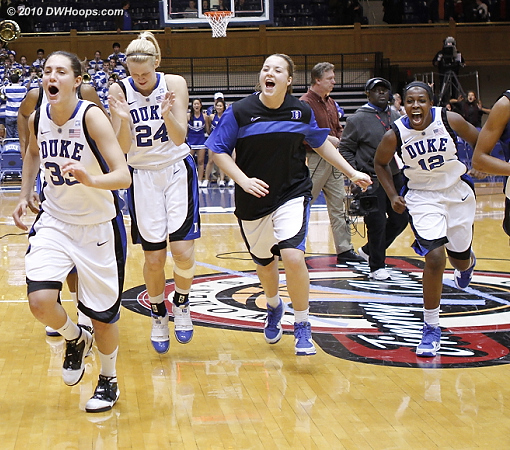 Heading to the locker room - winners! 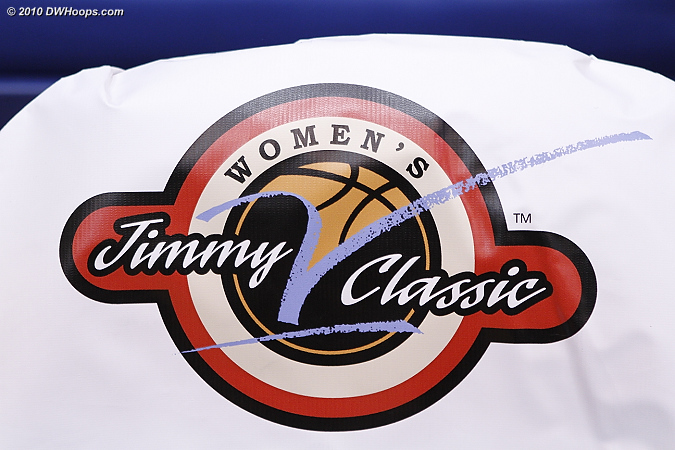 Tonight's telecast benefited the V Foundation. 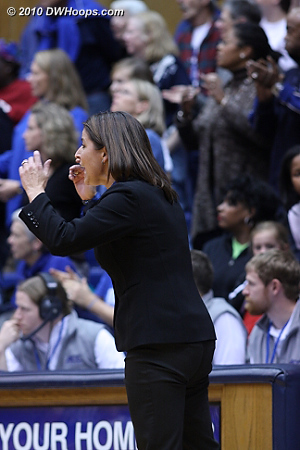 Both coaches expressed that Coach Valvano would have appreciated tonight's hard-fought game, and we agree. 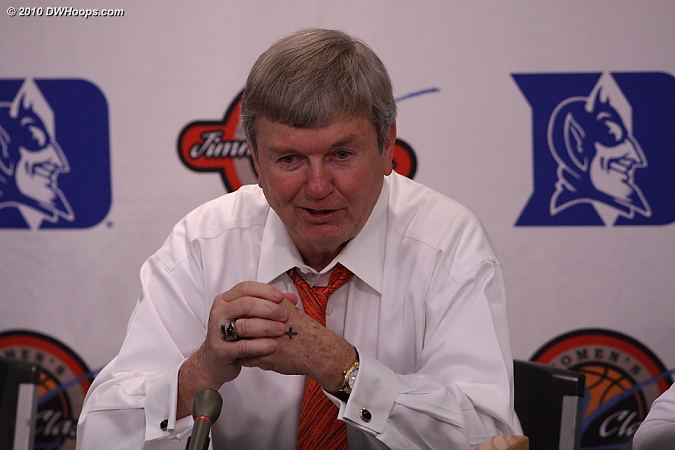 The soft spoken Coach Blair in the media room had only the nicest things to say about Cameron and its rich history, comparing it to the original Boston Garden and Wrigley Field. 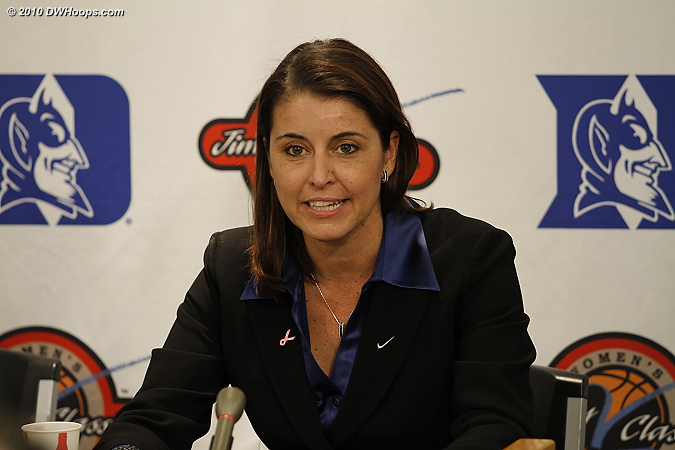 Coach P in the Media Room with Duke's first victory over Texas A&M in four tries. 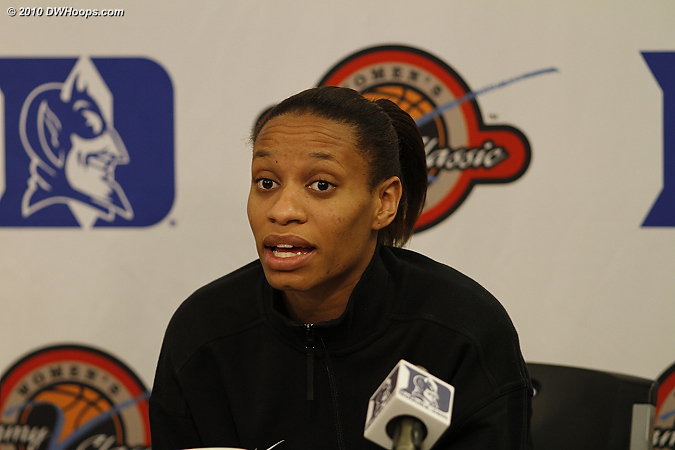 A modest Jasmine Thomas in the media room, a superstar and team player. 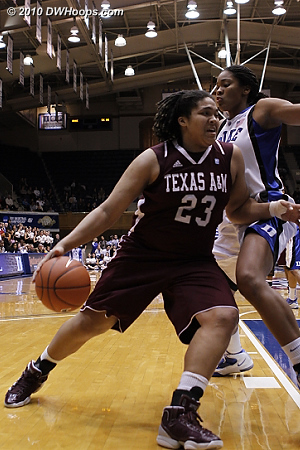 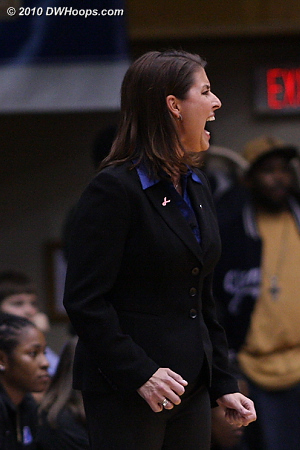 A beaming Karima Christmas was glad to finally get a win against her home state Aggies.